Beijing's bus system is cheap, convenient and covers the entire city - perfect for locals but, alas, difficult to use if you don't understand Chinese. 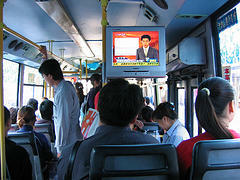 The bus staff speak little English, and only a few bus lines in the city center broadcast stop names in English. Bus stop signs are also entirely in Chinese. But should you speak Chinese or have a healthy sense of adventure, a bus can get you almost anywhere, and often somewhere that you never intended to go: it's a great way to see parts of the city that tourists normally don't visit. A flurry of shiny new buses have arrived on the streets in preparation for the Olympics. Many buses now feature air-conditioning (heating in winter), TVs, a scrolling screen that displays stops in Chinese, and a broadcast system that announces stops. If you are having problems navigating the bus system, call the English-speaking operators at the Beijing Public Transportation Customer Helpline (96166). 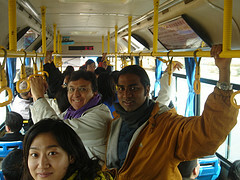 Warning: Beijing buses can get very crowded so be prepared and keep an eye on your valuables. Many pickpockets frequent buses and subways, so carry backpacks in the front, and try to put your valuables somewhere hard to access. Be aware of a scam offering bus rides to the Great Wall masquerading as the real bus service. Instead of directly driving to the Great Wall, you will instead be led to a series of tours to dilapidated theme parks, tourist shops, museums, etc before finally reaching the Great Wall near the end of the day. Bus lines are numbered from 1-999. Buses under 300 serve the city center. Buses 300 and up run between the city center and more distant areas (such as beyond the Third Ring Road). Buses in the 900s connect Beijing with its "rural" districts (i.e., Changping, Yanqing, Shunyi, etc) that are not considered part of Beijing proper. Full maps of the system are available only in Chinese. The Beijing Public Transport Co. website has limited information in English, but the Chinese version has a very helpful routing service with an interactive map. You can input your starting point and your ending point and see all the bus routes that will get you from A to B, look up a bus route by number, or input a place name and see all the routes that go stop there. Most buses with a line number under 200 run daily from 5:00 to 23:00. Buses with a line number greater than 300 run from 6:00 till 20:00-22:00. All buses with a line number in the 200s are night buses. Many routes get very crowded during rush hours (6:30-9:00 and 17:00-19:00). On all major holidays, there will be more frequent service on most city routes. For passengers paying by cash: Lines 1-199 operate on a flat rate of 1 yuan per journey. Lines 300-899 charge 1 yuan for the first 12 km of each journey and 0.5 yuan for each additional 5km. Buses with air-condition (800-899) start at 2 yuan. The night buses (200-299) charge 2 yuan per journey. For passengers paying by the new pre-paid Smart Card (yikatong): Lines 1-499 operate on a flat rate of 0.40 yuan per journey. Lines 500-899 get 60% off the cash price. There are also 3-day, 7-day and 15-day passes available for travelers. There is no return ticket or day ticket. Minibuses are very common in the countryside outside the urban areas. Privately operated, most trips cost less than 10 yuan per short journey and only a little more for longer journeys.